After taking a bold trip into the unknown, you'll be ambushed by three blue imps. This will probably be the first fighting you do in the game in these areas (unless you took on Gato at the fair or the enemies in Guardia Forest) so use tonics if you need them and rest in the inn later. 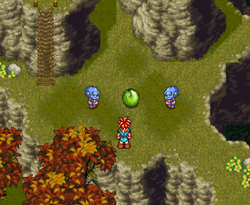 Each Blue Imp will die with just a single attack and Crono will only take a few hits if you react quickly. Move through the trees to the left to reach a large area with a rocky stream. One thing to keep in mind about monster fights in general is that virtually all of them are strictly optional. Meaning if you're fast, careful, or just take the time to avoid them you can skip most of the "random monster" battles typically associated with RPGs. This walkthrough will guide you on when to fight and when not to. One general tip that comes in handy is that if you stay perfectly still monsters won't bother you. You have to be moving to engage them in battle. Climb up, then walk to the left. Two birds will fly in and drop off two blue imps. 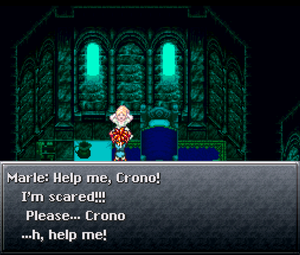 Dispose of them and Crono will level up to Level 2, earning him his first technique: CycloneCycloneWhirlwindWhirlwind. After the fight go up to the northwest corner and interact (Press Press Press Tap) with the first chest (a Tonic). Head south and collect the PowerGlove from the second chest. Head south and walk along the bottom edge to avoid the imps playing with green balls (if you fight them, it includes two blue imps and two roundillos). You can always come back to train later, but for now we want to minimize your character's level to unlock a secret. Exit to the south. Out in the world again, you'll notice it's a little different (mysterious one might say). Explore the village of Truce: while you won't know the year at first, but a woman within the northern residence will soon inform you that it's the year 600 A.D. and Guardia is at war with the mystics. If you nap at the inn, you'll notice a strange black box beside the bed; these will become useful much later in the game (see here for more information). 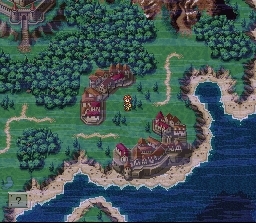 Out on the overworld, you'll also notice that the bridge leading to Porre has now been seemingly destroyed. Whenever you're ready, head into Guardia Forest to the west (just south of the castle). The shelter is within the bush Crono is facing, avoid the one to his left. Within the forest there are many enemies waiting to ambush you, both on the trail and within bushes. Note that there are six possible battles, if you take the left path you will only be required to fight three Blue Eaglets. (Note this is the only place in the entire game where you can fight them, and they only appear when you have one or two party members.) You can interact with bushes by pressing pressing pressing tapping ; but remember that there is only one bush that you'll get a Shelter from, the rest will turn out to be fights (if you want more, then reenter the map and grab it from the same bush; you can do this as many times as you like). Make sure to get the Power Tab at the bottom right area within the grassy patch (on the northern side); you'll have to fight two Roly Riders if you get close to the bottom shiny spot next to the rock. Head North to reach the Castle. As you enter you will be made fun of by the guards, who then get talked down by a familiar-looking queen. Explore Guardia castle if you like, or follow after the queen. Note that the ordinary non-sealed chests here can be gotten freely without affecting the corresponding chests in 1000 A.D. You can restore your health in the knight's quarters to the west (talk to the woman by the bed), or the kitchen to the east (stand in front of the north west chair and press press press tap while facing the table) where you can also pick up an Ether within a chest by the cooks. Note that the cooks give you a choice of what to eat: Refresh Salad which refills MP, Power Stew for HP and Hyper Kabob for both HP and MP. Eventually you'll want to head north, talk to the king, and head to the north east to visit the queen. You can talk to the chancellor before or after you visit the queen, he'll say slightly different things. If you talk to him before, he'll say "Hm..." and walk up the stairwell in the north west. Follow him up, grab the 100 G on the third floor and then talk to him at the top. He's acting very strangely, as everyone else has noticed. Head into his room where you can pick up a BronzeMail, equip it and then head back down. Head upstairs to the Queen's Room (north east or right stairwell), grab the Tonic on the 3rd floor, continue up and head south. Talk to the guard blocking the entrance, then continue into the room. Grab the Ether behind the chair. You'll find out that Queen Leene is actually Marle. 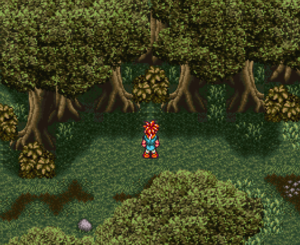 She'll thank you for coming for her, then suddenly teleport (notice the blue sparkles that appeared when Crono used the Telepod). Try to exit the Castle and Lucca will show up and explain that Marle is actually princess Nadia, and that Leene is her ancestor (although graphically they display her as being Nadia's Great Grandmother). Leene was going to be rescued, but they called off the search now that Marle was found. 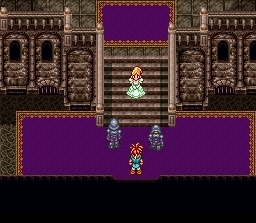 The problem is that if Leene is never rescued, Marle will cease to exist, so you and Lucca head off to rescue her. You can talk to a few people in the castle for clues or Toma in the inn (he enters after several seconds). Make sure you grab the BronzeMail in the king's room before you leave. This page was last edited on 29 April 2017, at 16:58. This page has been accessed 60,312 times.